Dr. Brian Hebl’s special interest in body imaging has resulted in expertise in a wide variety of body imaging services and a particular forte in musculoskeletal MRI. Prior to joining Radiology Associates in 2000, Dr. Hebl worked for Affinity Medical Group where he served as medical director of radiology for St. Elizabeth Hospital. He earned an undergraduate degree in biology, followed by honors postgraduate studies in physiology and a medical degree, all at the University of Wisconsin–Madison. He completed an internship and residency at Michigan State University, where he served as chief resident. 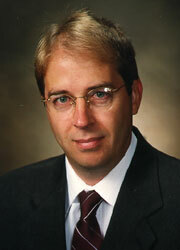 He also completed a fellowship in body imaging at the University of Wisconsin Hospital and Clinics. Dr. Hebl is board certified in radiology by the American College of Radiology, and is a member of the American College of Radiology.